Apocalyptic prophecy was designed to create a keen awareness of what God will do in the future and was meant to have a profound influence on Christian living. The dramatic climax of the eschaton with Christ’s Second Coming and its judicial implications is meant to inspire hope and warn against indifference. Sensitivity to that higher purpose has been blunted. Regrettably, scholars today tend to emphasize the “fact of the end” but minimize any imminent expectation. Though long ago Paul urgently focused on the pointed awareness of Christ’s coming when he noted: “… not giving up meeting together, as some are in the habit of doing, but encouraging one another –and all the more as you see the Day approaching…. For, ‘In just a little while, he who is coming will come and will not delay’” (Hebrews 10:25, 37 – NIV). I Corinthians 3:13, I Thessalonians 5:2, II Thessalonians 2:2, Jude 6, Revelation 6:17). It is the eschatological day, when Christ comes the second time. The intimation? There are distinguishing signs that herald that parousia. Encourage one another in that elevated hope. Jesus addressed the arrival of His kingdom as being associated with that Second Coming (Matthew 16:28), using the transfiguration as a metaphor. “For the Son of man shall come in the glory of his Father with his angels; and then he shall reward every man according to his works. Verily I say unto you, There be some standing here, which shall not taste of death, till they see the Son of man coming in his kingdom” (Matthew 16:27-28). The heavenly host will soon have this reaction: “And the seventh angel sounded; and there were great voices in heaven, saying, The kingdoms of this world are become the kingdoms of our Lord, and of his Christ; and he shall reign for ever and ever” (Revelation 11:15). This occurs at the eschaton. The disciples could have – should have – understood the kingdom–parousia association, but they didn’t. Immediately before Christ ascension they asked: “Lord, wilt thou at this time restore again the kingdom to Israel?” (Acts 1:6). God deemed it necessary and vital to detail, with anticipatory clarity, the events related to the eschaton! Great insight can now be mined from Daniel, as Christ urged in Matthew 24:15, and the penetrating narratives of Paul and John’s apocalypse. The stunning events immediately preceding and associated with Christ’s Second Coming are numerous and wonderful in their minutiae. What are we to “see” that convinces us that the “Day” is near? These “heavenly” events are associated with the sixth seal. When Christ breaks that seal a great earthquake occurs – then those signs follow. The breaking of that seal means that He has complete control of when to intervene and culminate history. The word “immediately” suggests that the signs in the sun, moon and stars bring the tribulation to an end. This is a fascinating saga. God’s glory is revealed in the heavens through these bodies. They now cease in that appointed task. It is like the when lights in an auditorium or theater are suddenly turned out. The staged drama is expected – the Second Coming of Jesus Christ in all His glory! Greek, Roman and Jewish writers recognized heavenly events as major turning points in history. The Old Testament also speaks of cosmic signs heralding the very end of time (Isaiah 13:10, 24:23; Ezekiel 32:7-8; Joel 3:14; Zechariah 14:6). There is to be nothing “secret” regarding this time. It is a global drama. The audience? The whole world. The stars of heaven will then be falling to the ground like unripe figs dropping in a wind (Revelation 6:13). Then follows this event: “And the heaven departed as a scroll when it is rolled together” (Revelation 6:14a). Matthew embellishes this further: “the powers of the heavens shall be shaken” (Matthew 24:29). Paul even notes: “Whose voice then shook the earth: but now he hath promised, saying, Yet once more I shake not the earth only, but also heaven” (Hebrews 12:26). From the Trumpets, Vials and now earthquakes, the earth is being de-created. Now the sky gets in on that drama. The “lights go out” and the very heavens shudder in anticipation of a celestial display of God’s glory as Christ approaches earth! There is one additional issue that now occurs that only Luke suggests. There is distress on the earth with great perplexity and the sea and waves are roaring (Luke 21:25; cf. Psalm 65:8, Isaiah 5:30). This picture is of utter anguish and torment of the wicked. Creation joins in the cry of its end. This occurs during the sixth Trumpet and the sixth Vial when everything is in turmoil, including within the evil spirit world! These celestial events occur during the sixth seal. They Biblically represent a “turning point” in history. Since Christ is breaking open the seals of the seven-sealed scroll, He determines when these events occur. Finally, the heavens are in chaos. Without any precedence, it becomes obvious that a supernatural extra-terrestrial incident is occurring. The stage has been set for a glorious divine summation to redemption. With Luke’s insight, all this occurs at a time when the earth’s inhabitants are in utter anguish. 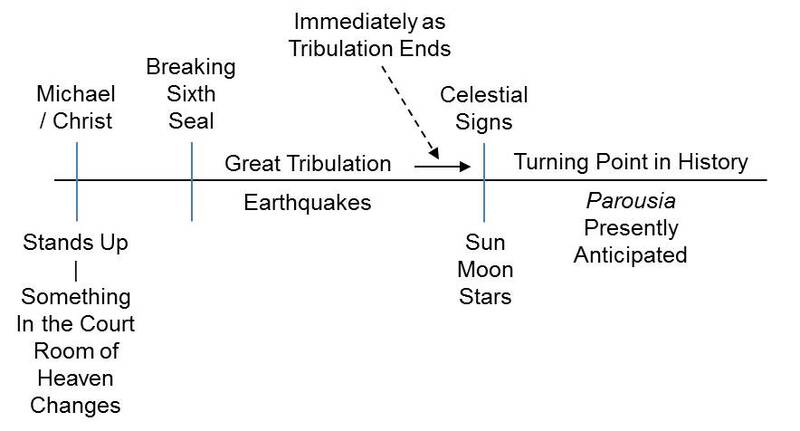 The tribulation and celestial signs with world chaos, is a stunning preface to what now occurs. There is much confusion as to what the word “sign” means. A sign refers to something that can be observed and signals or clarifies reality. The end of the verse announces Christ’s coming that could stand alone as a dramatic event. But – He’s coming in the clouds of heaven with power and great glory. John notes in Revelation 1:7: “Look, He is coming with clouds.” This attention-getting sign is the clouds. Note that the sign must appear in the heavens. It must be visible, comprehended and dramatic. This was alluded to in verse 27: “For as the lightning cometh out of the east, and shineth even unto the west; so shall also the coming of the Son of man be” (Matthew 24:27). Though many expositors relate this phenomenon to Daniel 7:13-14, that is very different! In the Danelic picture there is horizontal movement. Here there is vertical imagery. The former relates to the “marriage of the Lamb.” The latter to His Second Coming. In Matthew 16:27 it states that the Son of Man will come in His Father’s glory and with all of His angels. In 25:31 He is coming in glory with all the angels with Him. The evidence points to a cloud-like sign that is made up of the angels, exuding the “light” of God’s glory. His glorious coming in or on the clouds alludes to a “cloud theophany” (Matthew 16:27, 25:31; Acts 1:9-11; Revelation 1:7). Clouds also are a recurrent setting for the parousia (cf. Revelation 11:12, 14:14). Paul rivets this firmly in I Thessalonians 4:17, where the saints rise to meet Christ in the clouds at His coming. “and then shall all the tribes of the earth mourn” (Matthew 24:30b). This echoes the text of Zechariah 14:17, referencing the tribes/families of the earth. This alludes to the whole wicked world. The Greek word “mourn” is kopto (root) and means “beating one’s breast” with wailing and laments. What does this mean? The unregenerate recognize that they are lost. The execution of justice is now anticipated. They know it. “Howl ye; for the day of the LORD is at hand; it shall come as a destruction from the Almighty” (Isaiah 13:6; cf. 2:10-12, 20-21). “And the kings of the earth, and the great men, and the rich men, and the chief captains, and the mighty men, and every bondman, and every free man, hid themselves in the dens and in the rocks of the mountains; And said to the mountains and rocks, Fall on us, and hide us from the face of him that sitteth on the throne, and from the wrath of the Lamb: For the great day of his wrath is come; and who shall be able to stand? (Revelation 6:15-17). “The heart melteth, and the knees smite together.” “The faces of them all gather darkness.” (Jeremiah 30:6, Nahum 2:10). “Our God shall come, and shall not keep silence: a fire shall devour before him, and it shall be very tempestuous round about him. He shall call to the heavens from above, and to the earth, that he may judge his people” (Psalm 50:3-4). “But ye have set at nought all my counsel, and would none of my reproof: I also will laugh at your calamity; I will mock when your fear cometh” (Proverbs 1:25-26). “And before him shall be gathered all nations: and he shall separate them one from another, as a shepherd divideth his sheep from the goats: And he shall set the sheep on his right hand, but the goats on the left” (Matthew 25:32-33). Man’s reward relates to his life and how he reached out to others (16:27). “God is just: He will pay back trouble to those who trouble you and give relief to you who are troubled, and to us as well. This will happen when the Lord Jesus is revealed from heaven in blazing fire with his powerful angels. He will punish those who do not know God and do not obey the gospel of our Lord Jesus. They will be punished with everlasting destruction and shut out from the presence of the Lord and from the glory of his might on the day he comes” (II Thessalonians 1:6-10 – NIV). “And he shall send his angels with a great sound of a trumpet, and they shall gather together his elect from the four winds, from one end of heaven to the other” (Matthew 24:31). In anticipatory language after the dispersion of Israel were promises of a regathering from the four corners of the earth (Deuteronomy 30:4; Isaiah 60:4; Jeremiah 32:37; Ezekiel 34:13, 36:24; cf. Zechariah 2:6, 10). This became a prophecy of the universality of the gathering of the saints, both Jews and Gentiles at the end. These are the saints of the eschatological “tradition” (II Thessalonians 2:13; cf. Romans 8:33; Colossians 3:12; II Timothy 2:10; Titus 1:1; I Peter 1:1, 2:9). The belief by some that God’s people will be raptured before this time is not founded in Scripture. These saints have been chosen and will be “gathered” at the end of time (Isaiah 11:12, 43:5, 49:5, 56:8). This “gathering” refers to the true “rapture to heaven” at Christ’s Second Coming. The “change” of the living saints from having mortality to immortality. The raising of the deceased saints. The cue for the elect to be brought together comes from the sound of that trumpet. Anciently, this was sounded for “gathering” people together for religious or military purposes (cf. Isaiah 27:13, Exodus 19:16, Ezekiel 33:3-6, Joel 2:1). God’s people are gathered together in their eschatological salvation. This will be the greatest “religious event” in celestial history. Those angels who accompany Him are depicted as the “harvesters” (Matthew 13:39, 41, 49; 16:27). Christ’s exposé suggests that heaven is emptied of angels to accompany Jesus to planet earth. “When the Son of man shall come in his glory, and all the holy angels with him, then shall he sit upon the throne of his glory” (Matthew 25:31). Though there is an angelic harvest, it is, as noted, a time of separation. This is the implementation of the judicial work inaugurated in Daniel 7:9-10 and consummated in Revelation 4:2-3, 5:7. “And before him shall be gathered all nations: and he shall separate them one from another” (Matthew 25:32-33). This whole narrative is most informative. The inhabitants of the world have reached a point where there are only two divisions: one perfectly righteous, the other perfectly wicked. Both are in an irrevocable state. This is suggested by the phrase: “for the time has come for thee to reap” (Revelation 14:15). The eschatological narrative in Matthew 25 is unique in that Christ is called both the Son of Man (Matthew 25:31) and King (25:34, 40). This suggests the permanency of His divine and human nature! This amazing imagery is riveted later when Jesus calls those who served and helped others “my brethren” (vs 40) some translations suggest “the least of my brothers and sisters” (e.g., NET and NIV). Jesus, on His throne, as the Son of Man, is not then choreographing a courtroom trial. This is a “post-trial” event when the sentences are executed (cf. John 5:22, 27; II Corinthians 5:10). “This judgment is universal: all nations are gathered on his right and left, just as a shepherd separates sheep from goats (Matt. 13:41, 49; Ezek. 34:17 – 22). In this context (unlike Matt. 20:23), the right hand is the place of honor (22:44; 26:64; cf. 1 Kings 2:19), and the left hand is the place of shame (cf. 6:3: 27:38; 1 Kings 22:19). The Son of Man hands out the eschatological blessings or punishments (16:27, 13:41-43; cf. I Thessalonians 1:7). A final separation has occurred. In this redemptive summation the Son of Man bids farewell to 6,000 years of history, and as Savior to His people He cries, “Come … inherit the kingdom.” As a King He renders His first decree.